KATHMANDU - Supporters of Dr Govinda KC have accused the government of committing treachery by reneging on the written commitment it signed with Dr Govinda KC on Saturday to, among other things, form a health professionals’ education commission through a cabinet decision on Monday. Instead of taking the decision to form the commission, the meeting of council of ministers on Monday entrusted the cabinet’s Social Affairs Committee to look into the matter of forming the commission. The government had signed an 11-point deal with Dr KC on Saturday to broker an end to his hunger strike. Although it was agreed that the Monday’s cabinet would endorse formation of the commission, the government has delayed the process by sending it to the cabinet’s social affairs committee. Minister for General Administration Lal Babu Pandit, however, said that the cabinet has already begun the execution of the agreement reached with Dr KC. “The process has been initiated and the council of ministers will soon form the commission,” said Pandit. 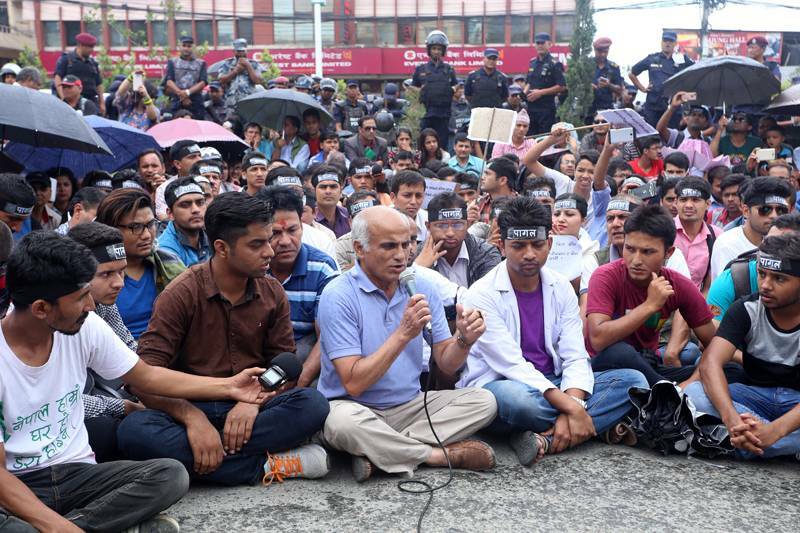 However, supporters of Dr KC have termed the government’s move as betrayal. “We are weighing the government move. I have understood it as a betrayal, conspiracy and disrespect to Dr KC’s sacrifice,” said Dr YP Singh, who was a member of Dr KC’s team that negotiated with the government representatives. Dr Govinda KC ended his 14-day fast-unto-death on Sunday after an 11-point deal was struck between him and the government on Saturday. Dr KC, who had already staged hunger strike five times in the past, had started his sixth hunger strike on August 24, demanding full implementation of the report on medical education submitted by a taskforce led by Prof Kedar Bhakta Mathema. Meanwhile, the cabinet meeting on Monday promoted Joint-Secretaries Kamal Shalig Ghimire and Mahesh Prasad Sharma Paudel of legal (Law) service to the position of secretaries. According to Minister Pandit, Ghimire has been appointed secretary at the Office of Prime Minister and Council of Ministers and Paudel as the secretary at the Commission of Investigation on Enforced Disappeared Persons. Likewise, the cabinet has appointed Revenue Secretary Rajan Khanal as the chairman of Citizen Investment Trust (CIT) and Madhu Kumar Chalise as a member of Social Welfare Council. The cabinet meeting has also finalized the name of 40 civil servants to be awarded on the occasion of Civil Service Day.